Discover amazing Street Art and Graffiti, in a variety of styles, technics and massages. Open your mind, be exposed to something new, laugh. Ask how street art and graffiti affect the urban view and the people of the city. Ask if its legal, and about the authorities stand. Do the artists try to protest and what about and what against? What makes a street artist tick? Why does she do it out in the street? Ask if the walls present you with anger or do they make you laugh In the south of the city, at an area of small industry, wild nightlife, tattoo shops, galleries, vegan restaurants and more dogs and pat-shops than drugstores, is the magical neighborhood called Florentine. There we will walk through the gallery of the streets, revealing large, colorful, and detailed works of anonymous artists that are a mystery to most. Known to have a special charm, excellent food and vivid nightlife, together with being famous for its amazing wealth of flourishing street art and graffiti, Florentine has lately become an attraction not only for artists and cheap renters but also for tourists and landsharks, renewing the city, replacing workshops for tall building, rapidly changing the urban view of Florentine, creating a shiny habitat from what used to be downtown. Come and walk with me to discover the artistic side of Rothschild Boulevard. We will travel down a path of authentic Bauhaus buildings, where we will meet modern Israeli sculptures and street art. You will be immersed in Israeli sculpture, and see its influence in history and solve the riddle of contemporary Tel Aviv culture. This tour is available during the day and night. Legendary people, dreamy houses, love stories, and great ambition drained into one place – Achuzat Bayit, the first neighborhood of Tel Aviv. Achuzat Bayit was and still is the beating heart of the city. We will walk down small streets of enormous beauty and listen to historical facts and funny anecdotes about the people who made Tel Aviv what it is today. In the south of the city, in an area of small industry, big surprises are waiting for you. 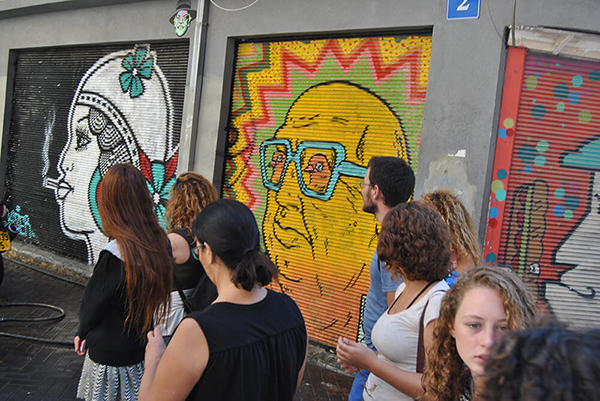 Come and discover the underground world of the graffiti artists of south Tel Aviv. On this tour, we will walk through the gallery of the streets, which will reveal large, colorful, and detailed works of anonymous artists that are a mystery to most. This tour is available during the day. Israeli graffiti artists use Hebrew to express themselves on the city walls, but they never use Hebrew for their names. What does the writing on the wall say? Who are these artists? What do the artists wish to convey and what do they wish to hide? Join me for a fascinating tour in a city where the streets actually speak. The tour is available during the day.